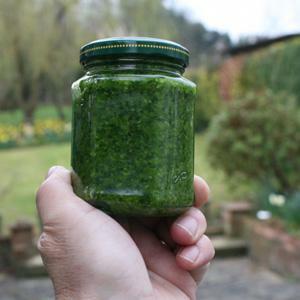 Last year I went foraging for the first time and found a plentiful supply of Wild Garlic (or Ramsom) under my nose in Grosvenor Park and turned it into a passable pesto. It's rather pungent and has a tendancy to smell out the house but it's not bad for a light pasta lunch. So first gather your Wild Garlic. Pick the leaves carefully, you don't need to disturb the roots. Nice! But why not experiment, there are loads of recipies on the Internet, and tell us how you got on.